There is something about book clubs that makes them more enduring and enlivening than many other activities. Participating in a book club provides baby boomers with new topics to think about and new vistas to explore. It prevents us from getting stuck in a rut. 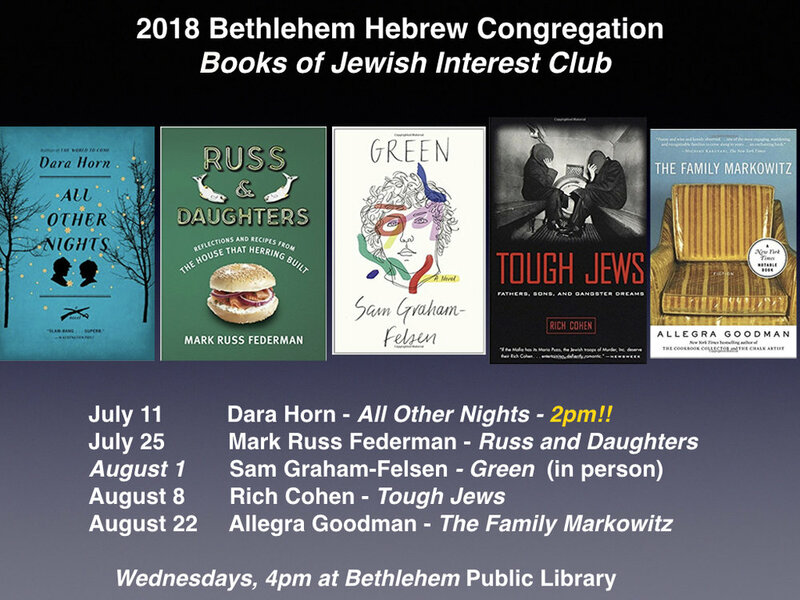 You’ll find book clubs catering for every niche literary category, and Books of Jewish Interest (BJI) Group is just one of these. After all, Jews are the ‘People of the Book’, and arguing is practically written into our national gene code. Getting together to discuss books seems perfect. BJI fills an important role in the North Country. It provides intellectual stimulation, mind-broadening discussions, social interaction and an excellent opportunity to make new friends. In addition to all of this, BJI helps satisfy a renewed interest in Jewish learning that many of us baby boomers have discovered. What better forum than BJI to discuss issues of Jewish thought, identity, and current Jewish social trends. Our general topics incorporate all things Jewish, including, but by no means limited to, fiction relating to Jewish themes or topics by any author, and non-fiction relating to Jewish history, culture, issues, and religion written by any author. Essentially, anything that can in any way be connected to a Jewish ‘dot’ is fair game for the BJI group. Gail Robinson, the convener, invites all to join BJI. Participants are expected to read the book listed for the date. We are looking for a different volunteer to lead the discussion for each book. Robin Greenlaw will be leading the discussion for Minyan and Michael Adler will lead the discussion for I am a Refugee. Instead of the leader preparing a lecture, the leader will present an informative summary of the book’s story or thesis and provided questions to stimulate the discussion. Building on last year’s success in hosting A.J. Sidransky discussion of Forgiving Maximo Rothman, we will host John Clayton (July 12th) and Michel Adler (August 23rd) to discuss their books this summer. This year, Bethlehem Public Library is co-sponsoring BJI with Bethlehem Hebrew Congregation. The Library is fully equipped with Wi-Fi and screens for skyping with authors. It is also handicapped accessible and has plenty of parking. We will be meeting at the Library (2245 Main St, Bethlehem, NH 03574) on Wednesday afternoon at 4 p.m. on July 12, July 26, August 9, and August 23. Minyan, John Clayton, July 12th. Join John Clayton in a lively discussion of his book. Minyan is a collection of ten short stories set in contemporary Boston. We will be discussing three of those stories: "Grandparent Option," "Forgiveness," and "O'Malley Recites the Kaddish." Washing the Dead, Michele Brafman, July 26th. Washing the Dead tells the story of a young woman ripped away from her Jewish Orthodox community for her mother's indiscretion. I am a Refugee, Camillo Adler, August 23rd. Join Camillo’s son Michel in reflecting on his father’s escape from the Holocaust. This memoir portrays the dreadful experiences of Camillo Adler and his family as Austrian refugees in France following the outbreak of WWII. The book vividly depicts life in the Swiss refugee camps and the family’s eventual unification. Meetings are open to anyone and everyone interested in participating in a reading group. Please call (202) 744-4646 or email Gail Robinson at gailkr48@gmail.com if you have any questions or would like to volunteer to lead a discussion of Washing the Dead or Notorious RPG.